Ralph Lalepa Koga’s teaching focus is on Hawaiian language, culture, poetry, geography, history, and the Hawaiian “civil war” era of 1782-1825. 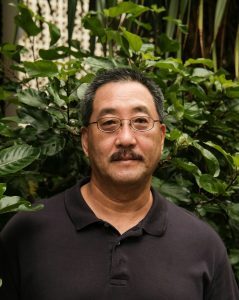 He uses primary and secondary sources exclusively in Hawaiian and English from printed, handwritten, and audio collections in archives, libraries, and audio collections to develop a curriculum that is relevant to students’ academic and community obligations. He continues to teach Hawaiian to community members unable to attend university, online, or adult education courses. He mentors former students who are non-teachers or students working for advanced degrees. He also works as a cultural consultant for literary, musical, and community projects, including local and international film and book projects.